Happy Friday! Yesterday was the start of the new Stampin' Up! Holiday Mini. I wanted to do some sneak peeks last month, but I just got my shipment last Friday. I made this card using the new Christmas Lodge stamp set and Forest Lodge designer series paper. Stampin' Up! has new quilted satin ribbon in the Holiday Mini. 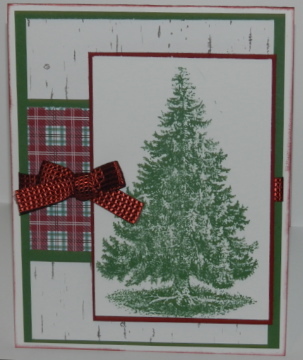 Hope you feel inspired to start on those Christmas Cards! Beautiful image! I love the gorgeous tree!